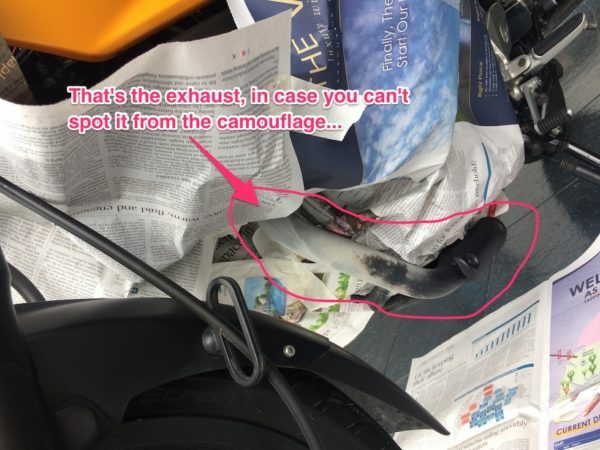 For those who are thinking of painting your exhaust with high temp paint, you might want to NOT consider this…. 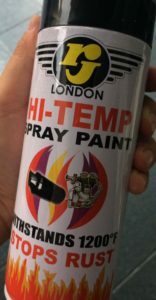 Bought a cheap can of high temp paint. Looked good for awhile, then started turning WHITE??!? Maybe because this was rated 1200F. I think Rustoleum has one that’s rated 2000F. Might try that sometime. 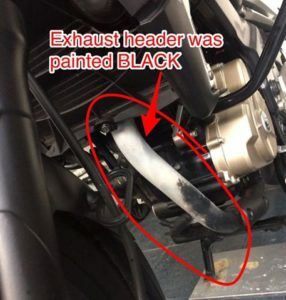 Was wondering how Rustoleum’s VHT paint on the exhaust will work out? Update 01May: After running about 2,000km after the Rustoleum was applied, the exhaust header still looked BLACK! Of course, dirt has started accumulating and it’s looking “used” – more grey than dark black, but I’m happy it’s not turning white like the previous product. So definitely THUMBS UP for Rustoleum! Hi, how’s ur Rustoleum paint holding up now? Did you do any follow up respray? At least the Rustoleum stays black (more like very dark grey) instead of turning white like my previous “high temp” paint. So most parts of the exhaust is still blackish. Rust has started to creep in in some areas though. And when I find the time, I’ll re-coat it again soon. I’m thinking of doing red. Not sure if it is a good idea..
No. Please, no. I know of someone (though not personally) who tried blue – because his bike was blue, and he regretted it almost immediately after. Hahah. Did you follow the curing procedures? Yes I did – although not quite to the T. I did warm it up and allowed it cool several times before going on a proper ride. 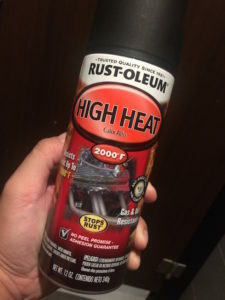 May I know where I can get the rust-oleum high heat paint ? I found it online which cost me about 21 dollar. Just thinking any cheaper source. I bought it from one of those DIY stores – can’t recall if it was HomeFix, HomeDIY, Self Fix or something like that. LOL! That said, I’m pretty sure you’ll love the results…. If you’re coating this for the first time, make sure you lightly sand down the existing layer of oxidation, wash it clean to get rid of loose contaminants before paint application. Personally, I prefer to paint the heat shield silver instead of the default black. You might wanna consider that too…. Previous Previous post: NanoProtech Super Insulation?